Nikola Tesla tour of Niagara Falls! So much happened in only one night and two days- hard to believe. Our Nikola Tesla tour of Niagara Falls was jam packed with natural, cultural, historical electrical goodness. I took a lot of time researching and planning this trip which became critical especially when it condensed down to needing to do it in just one overnight, heading back on Saturday. It turned out well and there were even some unexpected surprise bonuses, (oh yes, and disappointments too) so I will offer this blog post as both a guide and warning of what to look for in a Tesla field trip to Niagara Falls! At 5:50 am when I woke up in anticipation of our 4+ hour trip that day from Pittsburgh to Niagara. It was ungodly hot, the hottest night of the year so far, so it was easy to wake up from my poor sleep. This trip it was just me and Jenny Jean of the Tesla team, just like in January when we took a trip to Philadelphia to visit the Tesla Science Foundation and Tacony Academy Charter school. We left at 8:30 am with Buffalo NY as our first stop, most of the way there. When we got to Buffalo we were surprised at how dry the ground looked (a drought?) and how flat it was- and economically depressed. I had researched hoping to find some Tesla related monuments, exhibits, themed places etc. and found an article that promised a “Tesla City” back in December 2015, but couldn’t find anything about it actually having been finished and existing. Great idea, I hope it happens! Even so, Buffalo had both a promising sounding vegetarian eatery and an independent bookstore that might carry my coloring book. Food first, then business. It turns out picking ‘Amy’s Place’ for brunch was a good decision. It was a hole in the wall eatery oasis, with great decor and atmosphere. Mirror bubble ceiling tiles interspersed with 8 bit atari monsters and ginkgo leaf culture art show on the walls. Diner-y feel and cheap like one too, but with exceptional veggie fare. Jenny got the lentil breakfast and I got tofu scramble with white beans. Pickled beets, greens, jalapeños and yummy homestyle potatoes came on the plates. As you may be aware, Nikola Tesla himself was a vegetarian, and had very specific advice on this- see my Tesla vs Edison Diet post here 🙂 After stuffing ourselves we eased over to the bookstore area. There was a crazy amount of traffic lights, sometimes two per block, and the locals hated us because we went under the speed limit. It was New York, so of course there was a lot of honking and aggressive passing. Talking Leaves Books was in a bit better off area with Cafe’s, parks and fancy old mansions. I showed the manager my book and she seemed interested, saying they would contact me by the next day when I would be returning down south if they wanted to consign them. After that it was off to Goat Island at Niagara Falls, only 30 minutes away! Me sitting where the Tesla statue once stood. Good thing Jenny’s car (name of Brutus) had air conditioning, because it was 96 F and humid in Niagara Falls- not that it helped us when we got out of the car. On our way to the island we took a wrong turn and got to see the back side of Buffalo Ave- revealing a really decrepit neighborhood even more depressed than Buffalo. When arriving at the parking lot I saw the archway that was once a part of the original power plant, and thought I caught a glimpse of the statue too before we turned into the lot. It must have been a mirage or ghost imprint. We walked up and asked a park ranger where to find Tesla, saying we came from Pittsburgh to see him. “You’ve got to be kidding me” he said, and went back to finishing his conversation with some other folks. Then he turned to us and continued-“He’s away getting a bikini wax”. 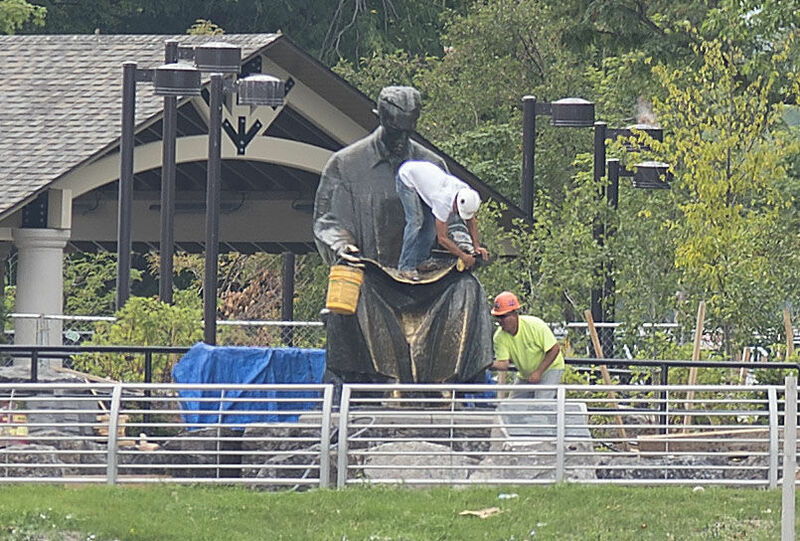 Apparently they had taken the statue away months ago for cleaning and repairs. Hmm, more likely a mustache wax? Soon they would bring the statue back (he didn’t say when) and are moving it to a new location somewhere overlooking the falls. I will definitely be monitoring this and plan a return visit! Fortunately there was much else to see on Goat island, the falls themselves are the main attraction and the reason Tesla was honored there in the first place. You probably know the story- when Tesla was a youngster still in Croatia he saw an engraving of the Niagara Falls and told his teacher with certainty- One day I will go there and harness the power of those falls for the people. And, 20 some odd years later, that’s just what he did- starting an electric revolution of the Industrial Age! The Edward Dean Adams Power plant at Niagara Falls went live in August 1896, transmitting power to Buffalo 22 miles away using Tesla’s turbine designs and AC system. And here we were 120 years later, on a hot day in August 2016. Naturally in all the humid heat we wanted to cool off in the fall’s mists- and that’s just what happens at Cave of the Winds. We got in line, paid our $17 ea and waited in the line to go down, getting the free pair of grippy flip flops as a souvenir. Neither of us chose to wear them, so we bagged them fresh and moved on down to the elevator and tunnel portion of the journey. There was a dark grey mass hanging in the air across the river and we heard thunder when in the tunnel. As soon as we had donned our yellow ponchos, which was actually quite tricky when they stick to you so hot and sticky, it began to thunderstorm. Perun, the god of Thunder who was personified by Nikola Tesla, was applauding our visit! It was actually really fun to run around on those rickety wood platforms drenched on one side by rain and the other by the falls, taking the wettest selfies on Earth. That rush of water power, so alive and dancing, there’s nothing quite like it. The plants and flowers around there certainly seemed to enjoy it- they clung to every impossible nook and cranny in a rock to grow in that rush of life force. The amusing park ranger had told us how to get to the top of the falls on the level with the water and look down, so that was our next stop. It wouldn’t have been obvious without his direction, because the usual stairway down to there was closed. (I found out later this was due to the secret Tesla relocation project). We had to go back on the path we saw on the way in then switching back down another one back toward the falls. Fortunately this part was free! We walked right over that bridge to Luna island, another awesome name and spot to view the American falls. There were many other tiny islands with more crazy plants and trees all clinging to life, nourished by the mad river rush. Though moving very fast much of the river is only one or two feet deep and you can see the algae covered rocks below clearly. It was somehow tempting to wade in there, but one wrong move or slip and you would be history! A Canada goose watched us from a log where it stood as we walked past. “You’re on the wrong side!” I joked. Little Teslas & my coloring book. Looks like he’s reading it! After that we were hungry and hot so went to the car to snack in the air conditioning. After our delicious farm grown veggies and fruit plus chips and crackers we made our way over to the gift shop, next stop. I wanted to make sure I got there to show them my coloring book before they closed. I showed it to the employees who were quite impressed and excited about it. “We get people asking about Nikola all the time” they said. I left a copy with the working manager to leave on the desk of their retail manager. I still haven’t heard back but will follow up with them soon. They had just one Tesla item already- these replicas of the missing Tesla statue of him reading. It looks like he is enjoying my coloring book! 🙂 After some memento shopping we headed over to the Horseshoe Falls on the Canadian side of Goat Island, can’t leave without seeing that! They have a more feminine feel with that horseshoe shape that curves way around, and are just as steep if not more so. So powerful and beautiful. The boats disappeared in the mist, and so did some crazy daredevil birds flying into it- hopefully they made it out alive. We saw a few dead seagulls at the bottom of the Cave of the Winds. After Goat Island we were pretty pooped and decided to head right to the AirBNB I had reserved, rather than the next planned stop of the old Adam’s Power Plant. What’s left of the Adams Power Plant, surrounded by a sewage treatment plant. Following along Buffalo avenue at pre sunset there was no need to do anything special- there it was sitting there right along our way! It was now on the property of a huge sewage treatment plant, looking abandoned and neglected with broken windows. This is the one remaining building of the first power plant built from Tesla’s turbines on the American side. Given more time we could have gotten closer to it, but I took this picture and felt satisfied that we had seen it at least. Kind of sad, and in character with the rest of the New York Niagara Falls town. We drove through a pretty rough neighborhood- one of the main streets had almost as many boarded up houses as occupied ones. There were duplexes with people young and old, black and white, hanging out with their toys and laundry hanging up. Once we got to the area of the AirBNB just a half mile or less away it was looking less ghetto with more maintained houses. After a bit of rest and snacking we got ready to head to Canada. Thankfully the cottage had AC (Air condition- the other AC!) in the bedroom in this heat, but the kitchen was pretty hot and sticky and so were we. Donning our dresses we headed for the Rainbow Peace Bridge and a Canadian dinner. My phone said there was at least a 10 minute delay due to traffic. This was a joke or bad information because it literally took an hour to cross the bridge which was bumper to bumper. Everyone wanted out of NY and into CANADA on a Friday night, and there were only so many lanes. Tesla statue at night on Canadian side. He’s not really green, I added that color- but it would be cool! I was concerned because we had an appointment to meet my new internet friend Boris, another Tesla advocate who helped organize the Niagara Falls Tesla day there in Canada last July 10th on his birthday. We zoomed onward after the border patrol let us through, and found the restaurant I had saw in the ‘vegetarian’ recommendation list, Moksha Indian Bistro. This place turned out to be a mistake, and I wouldn’t recommend it unless you like insanely spicy food and little selection, small portions, long wait times etc. etc. Boris was racing from Toronto to meet us and fortunately my cell phone was still working for text in Canada, but not for navigation. We managed to find him and meet up in a parking lot for the Imax. Boris is a volunteer teacher at the Serbian school as well as full time Dad and Tesla advocate, with a job at the Casino there. Despite being exhausted he made an excellent guide, showing us the excitement of night time on the Canada side. We headed directly for the Nikola Tesla statue that faced the falls. We saw the gigantic colored spotlights that lit up the falls all the way on the other side. Tesla was a little further down, up on a hill above the boulevard. He had some spotlights shining up on him too- Boris explained this was a new addition that came after much lobbying and red tape to raise the money and get it done, he had been in the dark before. There were also backlit letters spelling TESLA and a new stone sign with his namesake. The Serbian community was keeping his name and legend alive in Canada! We got out picture taken with the statue of course, it was so beautifully made- designed by Les Drysdale & erected in 2006, so it was ten years old. Boris pointed out the top handle of his cane was a pigeon head, how cool! Then we took a tour of the massive 24 hour Falls View Casino. It was like a minor indoor city with shopping mall, hotel and casino complete with 24 hour stores and bars. The best feature was a beautiful art nouveau influenced fountain, all lit up with animated turbines at the bottom and a sky dome light above. Boris explained that it had once had colored lights streaming out of the top and a recording about Nikola Tesla, but called him Nikolai Tesla as if he was Russian and had other erroneous info! What a world. I would have liked to see the lightning like lights but I guess it’s just as well they didn’t play the misleading recording anymore. I showed Boris my coloring book and gave him one to share around with the students and parents to see if they wanted to order them. He did not have a budget to buy outright and also the size of his classes are totally unpredictable. He gave us T-shirts from the July 10th Tesla birthday celebration, a nice keepsake. After some virgin cocktails at the bar we finally bid adieu around midnight- Jenny was practically falling asleep already having only got a couple hours sleep the night before- and he too had to get up at 5am. We finally got to bed around 1:30 AM, satisfied with our mega whirlwind tour. Note to self: return to Niagara Falls Canada side during the day, preferably not on a weekend and in a different season when it’s not so busy and expensive with more time to explore. Since I had such a weird night of sleep (probably from that indian food), I slept in until around 10 am. Sleep paralysis and bizarre dreams with turtles and crabs were wearing off slowly- we had just about an hour to get ourselves ready and check out. I didn’t have much of a plan for that day since we had packed so much into Friday. The main two stops were stores- gift shop I had visited and the one independent bookstore in Niagara Falls. I didn’t hold out much hope since they guy there had been so rude and discouraging on the phone, but I figured it was worth checking out the place and showing him my book in person. Fortunately the Buffalo bookstore had called back sometime Friday evening and indeed wanted to consign the coloring book. So now the Tesla Coloring Book is being sold in Buffalo at Talking Leaves bookstore, yay. No such luck for Niagara Falls, yet. The Book Corner had a really artsy window display with big pigs and other art and a bag that said “shop small”, The first thing you notice when you walk in is how enormous it is and the second thing is all the rules signs, especially the no cell phone zone. We browsed around a bit and I waited for the guy to say something to us, I knew it was the same one I had talked to on my phone. I showed him my book asking if he remembered our conversation. He grabbed it in seeming annoyance and started looking up the barcode on his computer, already knowing I’m sure that it would not be on his distributor list, and I said I was distributing it myself. “How much is it? Oh yeah, that’s too expensive for Niagara Falls. This is the ghetto- I tried to tell you that on the phone. I don’t like doing consignment or dealing with small people. I just buy from a distributor and they let me return the books I don’t sell.” It was all the same crap he had said on the phone. “You don’t deal with small people” I repeated out loud. Yeah, right! Shop Small it had said right in his front window. Sure you can appreciate the New York honesty, but beyond that i don’t get it. It doesn’t make sense- with consignment you can also return books to me that don’t sell. This is the endemic ‘everyone for themselves’ attitude- if it doesn’t fit into their bottom line or usual comfort zone then screw it, screw you. Too lazy to change, too bitter to care. Maybe the is why the area stays so economically depressed- no one will stick out for each other and build a sense of community! Despite myself I offered him to try out one book out for just $3, and see how it did. He said “Give me 5 of them for $3 and I’ll do it.” Seriously? So the artist gets nothing and you make all the profit? I said NO thanks. The one good tip we got from him was to check out the current power plant. So I got out my smart phone and looked up the Robert Moses Niagara Falls Power Plant, aka Power Vista. It was only a 5 minute drive north, and well worth the stop. First thing you see when walking to the visitor center from the parking lot is a gigantic turbine, like the kind they use from the falls now. It was the size of a cabin. The clouds were magnificent and the 70’s futurist building and bridge looked grand in a timeless way- I felt like I was back in the 70’s for a moment. When you go inside they give you a lanyard with a badge that has a magnetic key code that you have to register then you can use it to activate the many interactive kiosks in the place, playing games and racking up points or whatever. Probably more fun for kids, but we both went along so we could get our personalized badges. It took our pictures which we had to go around the corner to get printed out. The interface for that machine was completely bewildering and it took a local experienced tween to get it to work for us. We didn’t have long before having to head back home but we made the most of it- incredible views of the Niagara River, a cute replica of AC towers and animated info graphics on the the turbines, plus a chance to touch the Van de Graff machine and have a hair raising experience!!! It was so humid and my hair was short so I didn’t feel it going up so much, but every hair on my arms was sticking straight out. Jenny had a bit better luck in the back side. We were about to leave and the exhibit monitor asked if we had seen the Tesla vs Edison display in the basement- good thing I had mentioned we were on a Tesla field trip or we would have missed it altogether! We took the escalator down and there was a whole wall dedicated to the Battle of the Currents, complete with videos of Tesla and Edison impersonators taking turns to make their case for AC and DC. It was really well done- and yes, we know who won that battle! As obscure unknown as this place was, at least it is another dedication to the Master of Lightning Nikola, who deserves this recognition and so much more in both the US and Canada. In fact, there have been several movements or attempts to start a Tesla museum at the old Adam’s power plant, or elsewhere nearby. And now that I’ve blogged about it you can add it to your itinerary for your next Niagara Falls Tesla field trip. That’s all for now- signing off from Pittsburgh, PA- until next time! Nikola Tesla Tour Addendum- The statue was returned to the new location on 8-15- we missed it by two days!! I just saw in a Facebook post from the Niagara Gazette that the statue was “quietly returned” to new location at the Falls, Stedmans Bluff which overlooks the Bridal Veil and American Falls on the American side. Won’t the Canadians be disappointed, that he doesn’t look across the river at his other Canadian statue across from the horseshoe Falls! Turns out the National park or whoever moved it renegged on their plan to put steps up to the statue, and they also removed the original base which was part of the sculpture. The statue was made by Croatian sculptor Frane Krisinic. It was a gift to the United States from the Croatian government in 1976. No wonder he had to be cleaned up a bit, sitting there for 40 years! When they first announced moving it there were apparently protests from Tesla fans all around, for various reasons. Some didn’t want it moved at all, some think it should be in a museum, some want it over by the Canadian side, some want it to be up on the original platform or steps. Everyone has an opinion, and I am just glad it has been restored to public viewing. But they should explain why the pedestal was removed (if there actually was a good reason) and include images and intentions of the original formation, and take better care in positioning it so it is not overrun with people climbing on it. I definitely plan on returning in the Fall sometime to see how it has panned out! A Tesla centered Niagara Falls museum is a really good idea. There is definitely a lot of dark history in the area related to industrialization and exploitation of the populace there. Whoever is running tourism in these parks apparently has not shared the wealth with the city community for revitalizing and cleaning up Niagara. I hope some New Yorkers can take their heads out of their rears and mobilize a movement to give their region AND Tesla his due. The struggle is alive and well so the time is ripe more than ever for the people powered world he envisioned! « The 2016 edition of the Tesla Coloring Book is here! I love reading your blog posts. They are always very detailed. You basically did the trip Tesla Club wanted to do a year ago. Its always important to plan, and leave on time, which you guys did, and we didn’t, hence why we only got to see the statue and cave of the winds. I hope that next year we can all go together, including to the Canadian side. I am happy to hear that you got a small bookstore in Buffalo to sell your books! The Niagara Falls gift shop has to go through 50 levels of red tape before they can do something like that. But they don’t know what they are missing. Niagara Falls gets thousands of tourists a year who come there partially to see Tesla history. Your books would sell like hot cakes! Just keep nagging them, and eventually they will come around. The Adams plant needs to be turned into a Tesla museum. Maybe the oatmeal should start another campaign! Or maybe we should do it ourselves! This is excellent feedback and I like your ideas! I will keep after the store and my eye on the economic and energy evolution in NIagara and elsewhere. Sounds like we need to organize another trip to see the new statue location! Awesome Ava, I am so glad you loved it and thought of this Tesla coloring book as a gift for a dear friend! Let’s rock the evolution until the world is light. Tesla Movies, Schools, Museums – Oh My! The final stretch- New art, goals and perks! Tea with Tesla Launch Party! Art for Nikola- Share the Light!